The rotor poles align with the stator teeth depending on the excitation of the winding. The two coils AA’ connected in series to form a winding of Phase A. 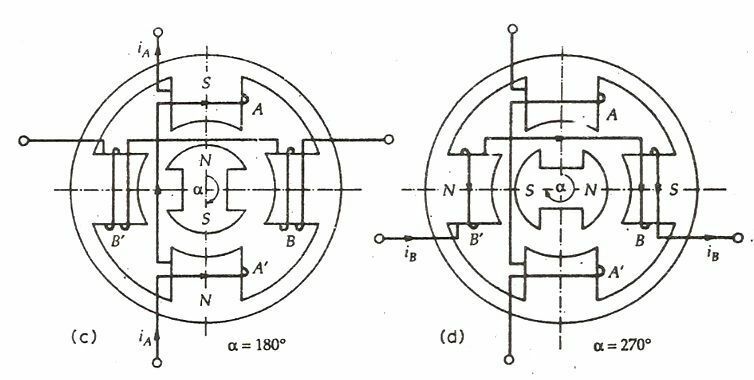 Similarly the two coil BB’ is connected in series forming a phase B windings.The figure below shows 4/2 Pole Permanent Magnet Stepper Motor. Completing the one revolution of the rotor for making α = 360⁰ the rotor moves further 90 degrees by de-energizing the winding of phase B and exciting the phase A. In the permanent magnet stepper motor the direction of the rotation depends on the polarity of the phase current.The sequence A+, B+, A–, B–, A+ is followed by the clockwise movement of the rotor and for the anticlockwise movement, the sequence becomes A+ B–, A–, B+, A+. The permanent magnet rotor with large number of poles is difficult to make, therefore, stepper motors of this type are restricted to large step size in the range of 30 to 90⁰. They have higher inertia and therefore, lower acceleration than variable stepper motors. The Permanent Magnet stepper motor produces more torque than the Variable Reluctance Stepper Motor.